i-site Koh Chang specialise in providing Tours, Transfers & Holiday Accommodation on the tropical island of Koh Chang Thailand. We also arrange a number of fun adventure activities, excursions & day trips for you to enjoy while you're visiting. Located in the town of Klong Prao (map) on Koh Chang's west coast. We offer information on local tours & travel, and an opportunity for you to check your e-mail in a comfortable, relaxed atmosphere. We provide high-speed internet access, overseas calls, print, fax & copy facilities. Our aim is to provide you with a service that is second to none and a holiday experience that you will look back upon with fond memories. We make it possible for our customers to enjoy a holiday on Koh Chang while learning more about the island and its culture. Travelling to Koh Chang? We provide daily minibus transfers between Koh Chang - Bangkok, Pattaya and Koh Samet. We also organise transport for Visa Runs and transfers to popular destinations in Cambodia. Choose between Private Taxi or Minibus to transfer you, your travelling companions and your luggage, safely and in comfort. We know how important it is to provide our customers with a professional, reliable service and aim to provide a high quality transfer service for all journeys. For those of you travelling a little further afield we organise transfers to Cambodia, between Koh Chang - Siam Reap, Phnom Penh and Sihanoukville. We also arrange Visa Runs to the Thai-Cambodian border. Our office is conveniently located on Koh Chang, which enables us to deal directly with tour, transport & other service providers on your behalf. Leaving you free to enjoy your holiday with none of the hassle. Want to see more of Koh Chang? Other activities for you to enjoy while you are visiting include Thai Cooking Classes, Diving Courses, Island hopping Holidays to Koh Mak & Koh Kood. High Speed Internet, a warm welcome and a relaxed atmosphere make i-site Koh Chang the ideal place to come when you want to send an e-mail, catch up with the news from home, update your blog, upload photos or just surf the internet. A selection of well organised short breaks combining good quality accommodation at popular resorts, arrival & departure meals, activity tours and return transfers from Bangkok or Pattaya. Set in comfortable air conditioned surroundings our Internet Cafe has a reliable, fast connection, is equipped with modern up-to-date computers and work areas. Internet access is charged at 1 baht per minute. All computers use the latest Internet Browser's, Office Suite's and Instant Messaging software. Anti-virus software is also installed on all computers. CD players, USB ports and memory card readers are fitted to all computers as standard. Connecting your camera, media player or memory stick is quick & easy. We provide our customers with a high quality 4 Mb's ADSL internet connection, via a wired link. Giving our customers an exceptional internet surfing experience, fast downloads and excellent video & call and quality when using Skype internet telephone. Our staff are knowledgeable, friendly & always willing to lend a hand, should you need any assistance when using the internet. We also have facilities for you to make local & international telephone calls, send a fax, copy print or scan documents. Find and book the best accommodation deals on Koh Chang. Choose from our wide selection of discounted accommodation and book online. Perfectly located in the centre of White Sand Beach. Ideal for those who like sea, sand & glorious sunsets. A true tropical garden setting, right at the beach with the rain forest and mountains as your backyard. Located on the picturesque Klong Plu river, surrounded by lush green mountains & tropical rain forest. Majestically situated on a cliff that descends to a private beach with crystal clear water & sandy shores. Looking to buy a House or Business? We have have a selection of Land, Property and Real Estate for sale in the Property Section. Need to arrange Car Hire? We have a wide range of Cars, Pick Ups and Jeeps for hire, day and weekly rates are available..
Set in an idyllic beach front location on Koh Chang's east coast. Baan Talay Thai offers high quality homes situated beautiful landscaped gardens. An excellent opportunity to acquire a large family house complete with 8 Rai of land, most of which is planted with mature fruit trees. Car Hire includes basic insurance, delivery service to/from your resort & full vehicle check before delivery. To book your transport, just complete the booking form on the Car Hire page or alternately, you can e-mail us for details..
Additionally, we have a selection of scooters available for rent from our shop. 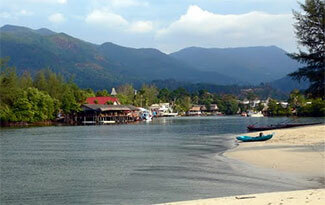 You can use the About Koh Chang pages to find out facts and information about the island. This section includes Maps, Travel Information, details about Koh Chang's Attractions & information on the neighbouring islands to the south. The Useful Information section contains more general information, telephone numbers, Government offices, immigration and Visa's. Or check out this page for a more extensive Koh Chang guide. If you have used any of our services, either in our shop or on-line, why not sign our Guest Book and let others know what you think!